Now modellers can finish their W.29 in the markings of the most famous W.29 of all, omitted somewhat surprisingly from the Wingnut Wings kit. ‘Captured’ offers modellers very distinctive & quirky finishes for the Pup & Albatros, in all three major scales. Both sets are relatively modest (reflected in the price), but up to Pheon’s usual standards of excellence. These two sets have been developed in response to requests from modellers and depart from Pheon’s usual practice of providing maximum choice, instead providing individual markings for only one or two specialty subjects. 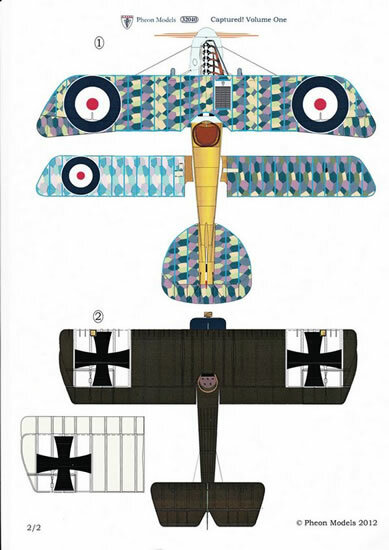 Captured aircraft are a niche subject that has had long appeal for modellers as favourite aircraft get decked out in the opposition’s insignia, making for quite an eye-catching contrast to the normal finishes. 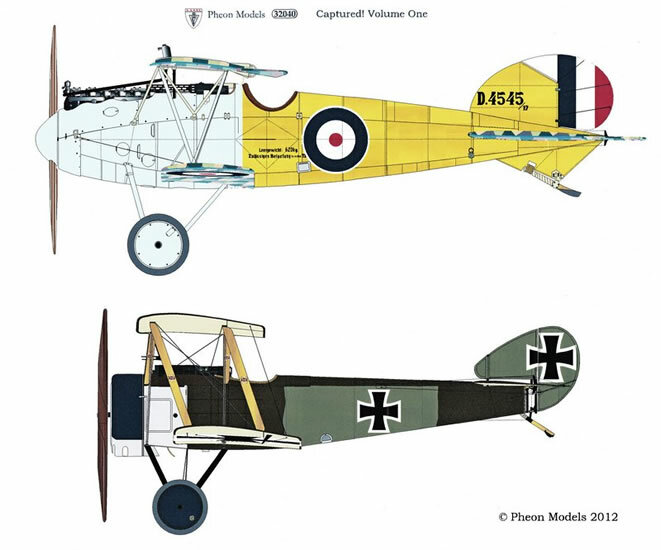 This set provides decals for one Sopwith Pup and one Albatros D.V and has been produced in all three popular scales, 1/32, 1/48 & 1/72. 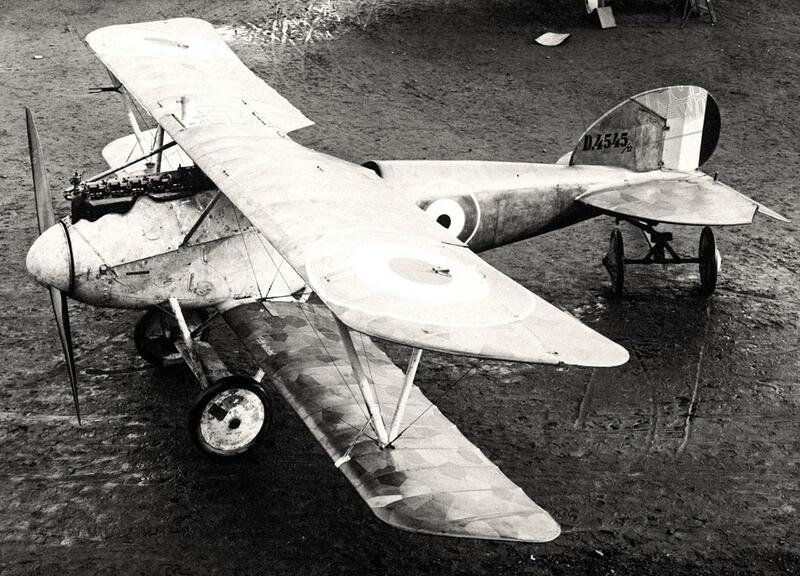 Albatros D.V 4545/17 came into British possession on 14th November 1917 as a consequence of AA fire (which must have been relatively light as there is little damage evident). The best reference for this aircraft is four photographs published recently in Albatros Productions’ Datafile 151 ‘Albatros D.V/D.Va at War Volume 1’ by Colin Owers. Wingnut Wings have published the four photos on their website and these are well worth checking out, especially to see the extent of weathering, wear and tear, etc. Although the aircraft is a D.V it has the reinforced interplane struts normally associated with the D.Va. It was fitted with a Wolff propeller. 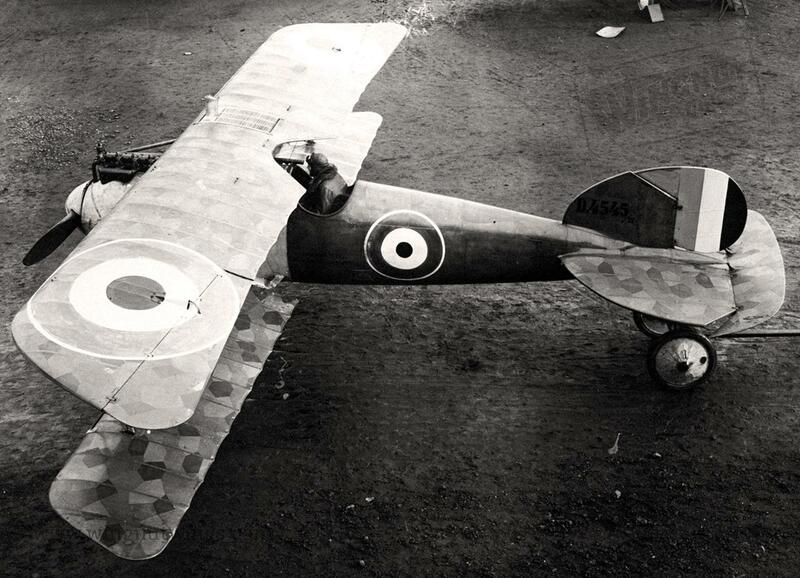 Pheon have got the historical Albatros font of the aircraft serial number exactly right. Cockades are printed with separate red centres to avoid any registration problems and the rudder stripes have cutouts for the rudder hinges. Pheon discuss various interpretations for the fuselage colours in the instruction booklet, an issue common to WWI modelling. The second subject of the set is Sopwith Pup B1721 of 54 Squadron, flown by Lt. ‘Fred’ Kantel. It was brought down relatively intact on 30th May 1917 while escorting FE2s on a bombing raid after having been in service for less than a month. The victory was claimed by Vzfw. Karl Holler of Jasta 6. Reference information is from Cross and Cockade International’s Vol 43/1 Spring 2012. 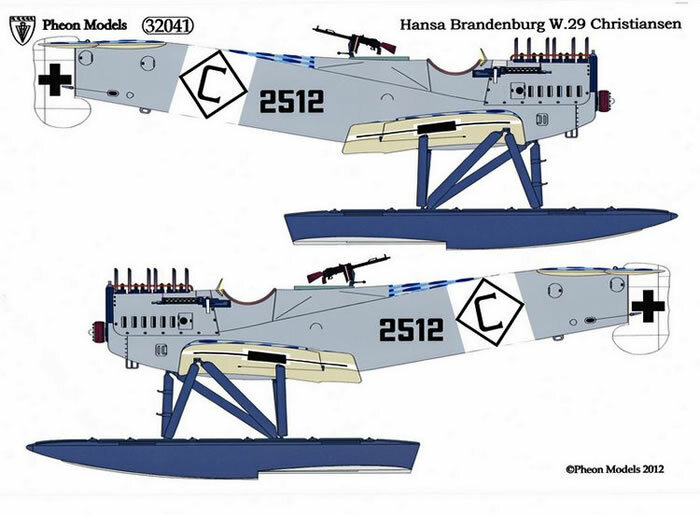 It was a surprise to many modellers that Wingnut Wings decided not to include markings for Friedrich Christiansen’s W.29 2512 in the kit. Friedrich Christiansen was Germany’s most famous naval air ace. He commanded the Naval Air Station at Zeebrugge, was awarded the prized Pour le Merite (the first of only three given to naval aviators and the only one to a seaplane pilot. In 1918 he was promoted to Kapitanleutnant and he finished the war with a total victory tally ranging from 13 to 21 (depending on sources). Under his leadership the Zeebrugge seaplane unit aggressively challenged the RNAS and Royal Navy over the English Channel. After the war he captained the massive Dornier Do.X flying boat on its maiden flight across the Atlantic. While his exploits during WWI brought him fame, Christiansen’s activities during WWII are more controversial. His conduct as Military Governor of the Netherlands caused him to be convicted as a war criminal in 1948 and sentenced to 12 years imprisonment (of which he served approximately 4 years in prison). This is a small decal sheet with individual markings for W.29 2512 and additional serial numbers in the Imperial Navy, style sized for the W.29, so that any other W.29 serial can be produced. 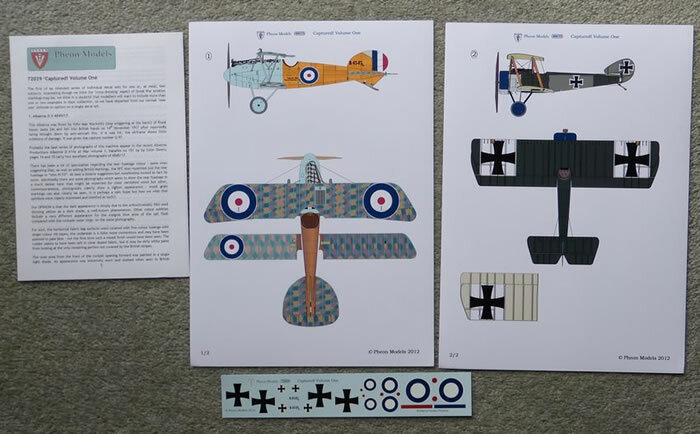 On the review decal placement guide, the colour of the floats has been printed as a dark blue whereas the Wingnut Wings instructions show them as black. 2512 was a C3MG version of the W.29 i.e. equipped with two forward firing guns and no radio, which is one the two main types of W.29 and also one of the kit options. National markings for the wings should be used from the kit. 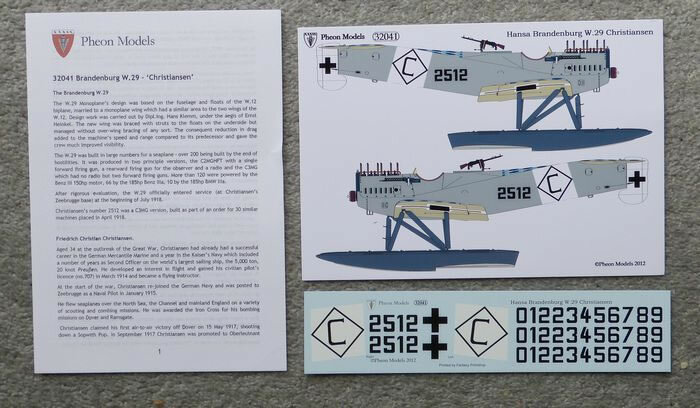 Although the decal instructions do not state which ones are correct for 2512, it appears to match Option C.
Sadly the kit is no longer available from Wingnut Wings, having sold out a few months ago. As usual, Pheon include full colour decal placement guides printed on glossy white card. The decals are printed by well-known UK firm Fantasy Printshop and have perfect register and minimal clear surround. The instruction booklets are somewhat abbreviated due to the decals being rushed out in time for release at Telford’s Scale Model World 2012. Pheon have promised to provide a more complete booklet to modellers who purchased the set and left their address details with Pheon at the show. 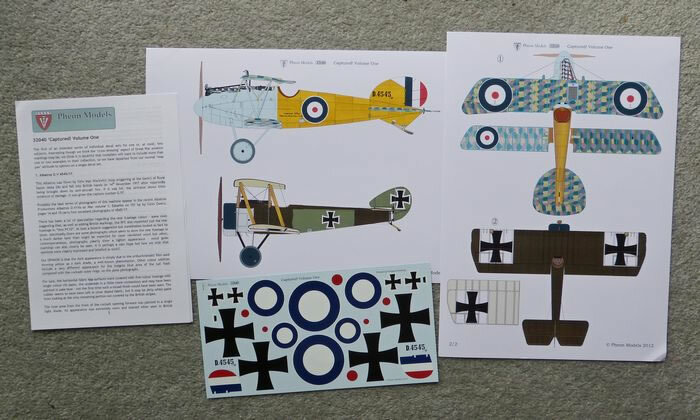 These smaller decal sets are priced more cheaply than Pheon’s standard releases, perhaps offering modellers better value, albeit with very limited choice. Once again a well-researched, quality offering from Pheon, highly recommended.